We’ve just had our first rehearsal this afternoon! In my opinion it went very well. This rehearsal was dedicated to ensemble building. I think that its very important for our group to feel comfortable with each other and feel as though they can share ideas and personal stories. Hopefully our ensemble will get stronger as we work, but I think today was a step in the right direction for that. We started rehearsal with a few warmup games. The first warmup game I called “rabbit in the hole.” I’m not exactly sure what its called. I learned it in my devising class at Kingston University in London. For this game, there is a person who is a rabbit and a person who is a fox. The fox chases the rabbit, and, if the fox tags the rabbit, then the rabbit becomes the fox and the fox becomes the rabbit. The way for the rabbit to save him/herself is to find a hole for safety. The rest of the company (the people who are not the rabbit or the fox) form the holes by getting into pairs, standing and facing each other, putting there arms straight in front of each other and resting their hands on each other’s shoulders. When the rabbit finds a hole that he/she would like to inhabit, he goes inside it and takes the place of one of the two people forming the hole. Now, whichever person the rabbit has replaced becomes the rabbit. This game was very fun, and I think it got everyone’s blood flowing. 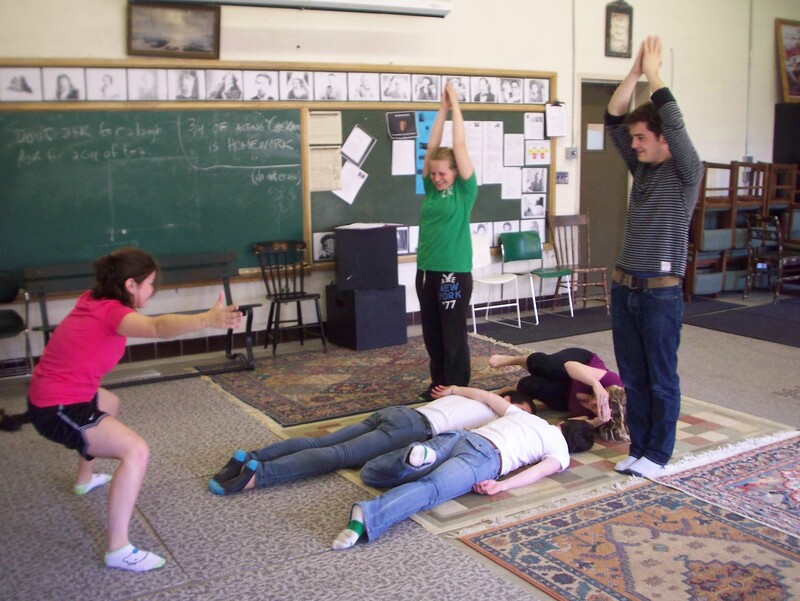 Next, we did an activity that I learned in a devising workshop at the Kennedy Center American College Theatre Festival. For this activity, everyone walks around the room and points to objects and says what they are. After doing this for a bit, everyone continues walking and pointing to objects, but they have to name the object that they pointed to previously when they are pointing to a new object. The purpose of this game is to get your mind active. You are pointing at one object, but your brain has to remember the object that you just pointed to previously and recall it’s name. Our final warmup activity was called pass the clap. In this activity, we all stand in a circle and one person faces a person next to them, makes eye contact and claps. The person that they are facing claps at the same time and then moves on to the person next to them and does the same thing. This gets sent around the circle and the hope is that is speeds up and the group will tend to develop a rhythm. A person can reverse the direction of the clap by doing the following: when a person receives the clap, she will clap with the person passing it to her and then clap again to pass it back, the clap has now changed directions. After warmups we moved onto activities focused on building our ensemble. We walked around the room and as a group we counted up to 20. One person could only say one number at a time and if two people said a number at once, we would have to start over. We got up to 20 in one try so we moved onto the next activity. Continuing to walk around the room, we all had to stay aware of each other and stop at the same time. After doing that a couple of times, we continued walking and we all had to jump at the same time. These things are obviously virtually impossible, but there were a couple of times that we all seemed to connect and we were able to jump at the same time. I think the group was feeling pretty connected at this point so I wanted to do an activity that would push this even further and that I think also exemplifies the group dynamic of devising. In this activity we split into partners, and one person led while one person followed. The leader held her hand about a foot from the follower, and led them any which way around the room. We switched roles and then I had each leader also become a follower to a different person in the company. This created a large blob of people following other people’s hands. I see this as a good exemplification of what I hope our group dynamic will be. I’m hoping that every person will be able to lead and follow, and that by doing this we will lead each other in many different directions, but we will be able to trust our fellow artists. Our next activity was to create objects as a group. The objects that we created were a copy machine, a sprinkler system, a stove, a refrigerator, a lawn mover, a bed and a blender. Here are some pictures of our objects. I found this to be a very fun activity. At first we told each other which part of the object we were and then we challenged ourselves not to talk for the last few. Our next activity was to tell a story all together speaking at one time. We were all telling the same story. This is a funny exercise as we all obviously do not think alike and different things come out of people’s mouths and then we all have to choose in a split second which direction we will take the story. This is similar to devising. Our last activity was one that I learned in my devising class at Kingston. We all told a story individually using action. We all decided on the story topic, which was the best meal we had ever had. We then split away and crafted our stories. We presented our stories to each other. We then took our individual stories and put them together to make a scene. We had a few different ideas of what we could do with this scene. We only had time to use one of these ideas, which I think presented a pretty interesting scene. In the future, I would like to do this activity and try out all of the ideas that we come up with to create many different scenes from which we can pull out favorite material. I am very happy with how today’s rehearsal went and I am looking forward to the next time we meet!